You're probably familiar with pumpkin but what you may not realize is that some of the acids that pumpkins contain can actually be very beneficial to your skin. And this is important for more than just its effects on your skin! Pumpkins, otherwise known as Cucurbita pepo, are a rich source of naturally occurring chemicals which have been shown to help reduce inflammation, improve wound healing, act as anti-oxidants, and even fight off certain infections. These benefits come from the bioactive components inside of pumpkins, especially the seeds. And this is not some sort of trend or fad either, pumpkins have been known to have these benefits for many many years. So how can you use pumpkin to help benefit your skin? The best and easiest way is to apply a mask or to use the enzyme in pumpkins as a peel. But what exactly is an enzyme? Enzymes are special proteins found in certain plants (you have tons inside of your body) that perform very important tasks. Most notably, and relevant to this article, is how they influence your skin. When you place an enzyme on your skin it acts to digest dead skin cells on the surface of your skin or epidermis. By reducing the number of dead skin cells you can leave your face feeling refreshed and sharp as you remove the dullness provided by dead skin cells. In addition, enzymes also help to open up pores and allow for easier extraction of solidified sebum (blackheads) and in this way they also act as an exfoliant. All enzymes work in this way, but certain fruit and plant enzymes are better for some conditions and worse for others. And that's why we are going to talk about pumpkin enzymes today! Pumpkin enzymes are ideal for all types of skin (compared to other enzymes such as papaya which is better for sensitive skin). We'll talk more about who should use pumpkin enzymes in a minute, but for now, let's talk about peels and masks. So, what exactly is a pumpkin enzyme mask? An enzyme mask (whether it's used with pumpkin or some other enzyme) is the act of placing a highly potent enzyme directly on the face and allowing it to set in and get to action. You can think of pumpkin enzymes as acids that are essentially dissolving the dead skin cells on your face. The longer they sit on your skin and face the more dissolving they will do. You can also adjust the relative potency of these enzymes based on the percentage of acid that the product you are using contains. The higher the percentage the more acid and the stronger your mask will be. The stronger the acid the smaller amount of time you want to leave it on your face because too much of a good thing can be a bad thing! Chemical peels basically follow the same concept. Who should Use a Pumpkin Enzyme Mask? Should everyone jump on the pumpkin enzyme bandwagon? I find that you can get even better results when you combine pumpkin with other fruit enzymes or acids. The combination of natural fruit enzymes with stronger acids can get you better results in a shorter period of time. I find that orange pairs very well with pumpkin and the two can be added together. Orange naturally contains a high amount of Vitamin C as well as naringenin which is a powerful anti-oxidant. We already know that pumpkin contains bioflavonoids and anti-oxidants as well as acids which act on the skin. By combining these two fruits together you get even better results. The pumpkin enzyme that I use is only available for professional use but I found an over the counter version that has great ingredients as well. This pumpkin mask contains pumpkin but also contains Vitamin C and retinol, both of which can help treat acne, refine the skin, reduce pore size, and help with exfoliation. If you want to try a pumpkin mask (pre-made) then this may be the best option (link to Amazon). The application of this mask will be different when compared to the home-made mask (discussed below) because it also contains other ingredients. So just be sure to follow the instructions because the potency of the enzyme will determine how long you need to place it on your skin. 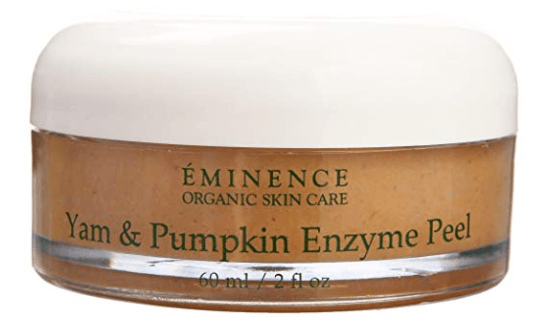 If you prefer a more natural/organic-based product then the pumpkin mask from Eminence may be a better option for you. This combination pumpkin mask contains both pumpkin and yams and is ideal for all skin types. In addition, it also contains more natural ingredients such as food-based oils, pineapple enzyme, papaya enzyme, white willow bark extract, lavender oil, and other essential oils. This combination would be ideal for those with more sensitive skin types who want an organic product. If you are seriously health conscious and you want to avoid placing any sort of chemicals on your skin then I have the solution for you. Instead of purchasing a pumpkin enzyme and placing the mask on your skin yourself, you can also create your own home-made pumpkin mask. The only thing worth considering if you opt for this route is the fact that your mask may not be as potent. Which means you may need to use this mask 2-3 times per week (for several weeks in a row) to get your ideal results. That's perfectly fine, I just you to be aware! You can compare this to more potent pumpkin masks which can give you results after just 1 or 2 sessions. You can use this for all skin types but you can further adjust your regimen based on your own personal needs! If you have mature or damaged skin then a lemon zest enzyme may be ideal. If you have sensitive skin then a papaya enzyme may be ideal and so on. I plan to create a fruit enzyme guide in the future so be on the lookout for that! 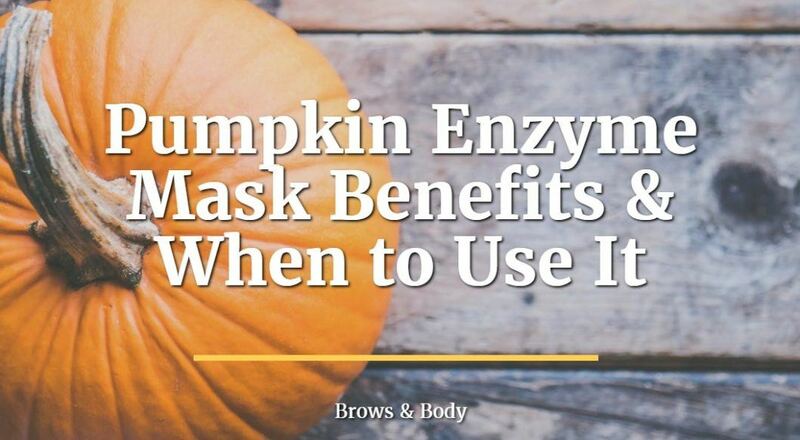 Pumpkin enzyme masks can definitely stand to benefit the skin of many women (and men!). Most of the benefit probably stems from the fact that pumpkin has natural anti-oxidants and because it helps to naturally exfoliate the skin without damaging it. It can be used on all types of skin and you'll probably find it in many skin care products (you can't miss it because of the smell). I am a personal fan of pumpkin enzymes and peels and it's one of the masks I use on my own face (I have combination dry/sensitive skin which is slightly prone to acne). You can use pumpkin enzymes either by purchasing a high-quality enzyme which is pre-made or by simply making your own home-made mask. You'll probably get faster results by using a pre-made mixture but if you like the all-natural approach then you may prefer the home-made version. 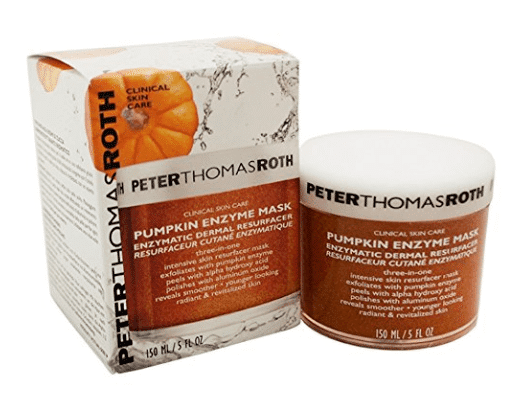 Have you used a pumpkin enzyme mask before?